As some of you know, I've been doing a "Lego 30-day challenge" where I try to do a different Lego-related project every day. I also wanted to determine a realistic scaling factor for Minifig scale buildings. In doing so, I confirmed my suspicion that Minifigs are either too wide or too short. 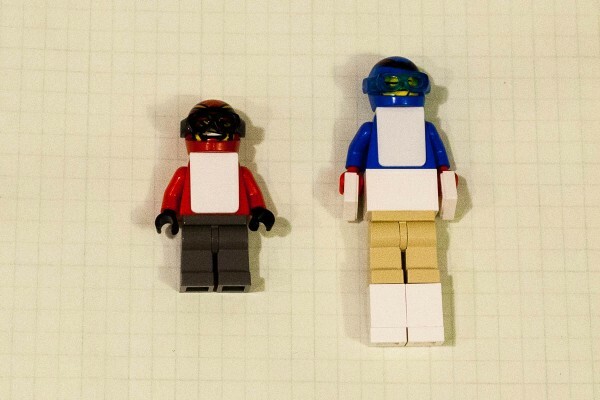 I'm curious to hear what other people use as their scaling factor for "Minifig scale", and also curious if others have found better ways to modify a Minifig to have more accurate human proportions. I estimated normal minifig scale to be about 47:1, but also determined scaling factor for my anatomically modified minifig. Any mistakes in my SI unit concept for Lego, or any thoughts on a more accurate Minifig-scale conversion factor? I'd love to hear your thoughts! As to accurate minifig scale conversion to human units - you need two conversion factors. One vertically and one horizontally. As minifigs are more squat than humans, their buildings should be too. Interesting, I wouldn't have thought to make my "Scale" model of an existing structure have a different scale in the vertical axis. You are correct that this would make the structure more accurately following minifig scale, but it might look weird to squish a famous structure in this way. I'm curious to hear whether others employ the trick you suggest, just rely on height for scale, or use other approaches. If you want to make something famous looking, then go for real world dimensions otherwise it will look squashed. If you want it minifig scale, base it on the height. You can always rotate minifigs sideways slightly and they look thinner. But if you are building a minifig city where they have to sit in cars for example, and if you want two people sitting side by side in it, then chances are you will end up with a wider car (for a given length) than you would in the real world. Similarly, the standard lego doorway is wider than it would be in the real world. I think I once worked it out (based on minifig height and average male height (about 5ft10)) to be about 1:44 or 1:45 scale. I can't remember now. As @CCC says, you can always rotate them sideways, or just pretend that minifigs live in a world where everyone is obese. You also have to remember that women that wear skirts are taller than men in the lego world. or just pretend that minifigs live in a world where everyone is obese. It's that, or use Friends minidolls instead. Great article, I have added a link to the BW article. Very high heels are under them. Interesting idea about them not having correct proportions; makes sense but I never thought of it before. There's also a previous theory about minifig scale here if you're interested. So does that mean that a minifigure can be used for O (1/43) scale? I've always thought that a minifigure was roughly 1/32. I think personally, that the scale of minifig vehicles, like others have mentioned in the previous thread is somewhere in the 1/50s as they are similarly sized to some of my Siku models, which almost all are 1:55. So does that mean that a minifigure can be used for O (1/43) scale? Yes, sort of... 1:47 is what I calculated based solely on the height of a minifigure based on an 5'10" human. The minifig just so happens to be almost 2x as wide and 2x as deep as a normal human. If the average 5'10 male is ~150 pounds, then a minifigure-proportioned adult male would be about 150x2x2 = 600+ lbs. Hence the eating disorder comment some time back. I typically like to define minifigure scale by compromising height and width. But doing this with a minifigure is hard because it is difficult to measure human width and minifigure width comparably: a minifigure's widest point with their arms at their sides is their hands, which isn't true of most human beings. Let's go about this a different way. The door to my bedroom is around 80 centimeters wide by 200 centimeters tall. A door for a 1x4x6 LEGO doorframe (the most compatible in terms of size relative to a minifigure) is around 2.8 centimeters wide by 5.2 centimeters tall. The proportions are different, so we'd get different results if we were comparing height or width on their own. But suppose we were to compare the combined height and width of one with the combined height and width of the other. That would instead lend the amazingly convenient result of 1:35. Naturally, minifigure scale has to be adjusted according to context. But 1:35 and 1:36 tend to be the scales I prefer, depending partly on whether I'm working in metric or imperial measure. ...women that wear skirts are taller than men in the lego world. I know plenty of women who are taller than men. In other news, I just noticed that I'm still getting a good deal of traffic to my blog from this forum discussion. I was a little surprised, given that this is a 3 month old thread. It looks like this thread is a popular hit when searching "lego minifig scale" on google/bing, and those visitors are clicking through to my blog.